Loving Tuscany means to love his food, fragrances, textures ….. you can not claim to know this earth without knowing his kitchen. Eggs, flour, and products of the game were the basic ingredients of the traditional Tuscan cuisine and today this ingredients will use in cooking classes to those who choose to live this experience. 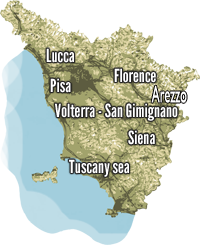 Divina Toscana organizes for you weekend or longer stays for couples, groups of friends, Team Building, under the banner of the tradiction and challenges in the kitchen. 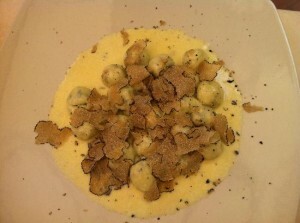 It ‘a new way to experience Tuscany, enjoying the quiet of the countryside, the quality of the products and the valuable lessons of professional chefs who will follow you during all stages of food preparation and teach you little tricks on cooking time and the right amounts of flour or other ingredients. 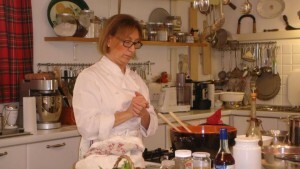 At the cooking school of Mrs. Lella discover the pleasure of culinary research and ancient Tuscan recipes. 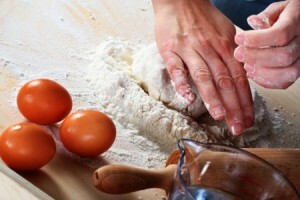 The lesson consists of the creation of dishes. Appetizer, soup, white or red meat, side dish, dessert. A typical Tuscan menu, including a hand made fresh pasta. Guests will receive handouts with recipes in language. The course starts at 10am and lasts 2 hours and 30 / 3 hours, starting with a small snack with sparkling wine, cold cuts and hot freshly baked focaccia. You’ll start preparing bread and focaccia, you follow up with the appetizer, homemade pasta with meat sauce, main course and dessert. Finished in the kitchen you can test the dishes in the dining room with wine pairings for each course. Our philosophy is based on sharing our cooking experience with our guests, giving them tips and ideas to put into practice then their creativity. Each client will have a personalized cookbook.